Cheri Adolph grew up with her family living in their homes attached to the cafe's and restaurants her mother and father owned. Cheri helped out in the kitchen during her school lunch hours peeling potatoes and making french fries for the Senior High Students when they came over for their lunch. Cheri is about Family! 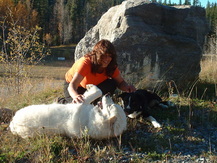 She and her family; husband Rolf , their son Mike and their daughter Jenna took a huge leap of faith in 1994, sold everything in Spruce Grove, their house, their possessions, quit their jobs; Cheri as a clinic manager and Rolf as an Electronics Technologist and moved to Nordegg to build their lodge "the Sheiling", and their outdoor business "COE" together with another couple. In 1999, the Adolph's found themselves buying out the partnership and becoming sole owners of the business. Starting over again, changing the philosophy of the business, 17 years later it is evolving exactly as it was meant to. A lot has happened since the beginnings, the Adolph family has been blessed by the addition of Greg (son in law), Jen (daughter in law) and two (almost three) beautiful grandchildren, all of their clients, including many kids from the youth programs, becoming extended family or at the very least close friends. The staff of the Sheiling and COE whether past or present are family, and Cheri considers them all her "kids". They come home from time to time to work, to help, to live and to play! Cheri feels blessed every day that their family dream is coming to fruition. To have a place where people of all ages can come adventure, retreat, relax, have fun and feel a part of the family. Together with their grandchildren Aquin and Cooper and the family dogs Rocky, Wilson, Zoe, Ember and Hobo; guests are left with a sense of belonging to something special! Cheri is noted for her saying "There is no such thing as risk, only adventure", " What's the worse that could happen? We would just start over...again."